David Ginola crossed the football divide from the pitch to a pin-up long before the days of David Beckham and now he wants to be Fifa president. The 47-year-old Frenchman wants to stand against Sepp Blatter to sit at the helm of world football's governing body and is being paid £250,000 by a betting firm, which denies the campaign is a publicity stunt. BBC Sport takes a closer look at the ex-France international's career. As a player, Ginola was box office. He produced moments of magic to stun the opposition and wow fans. The winger wouldn't win any prizes for tracking back, but for some his attacking ability more than made up for it. In his native France he played for Toulon, Racing Club de Paris and Brest before his big move to Paris St-Germain. He helped PSG to the league title in 1993-94, while he also won the 1993 French player of the year award and 1993-94 Ligue 1 player of the year award in his time at the club. A move to Newcastle United followed before spells at Tottenham, Aston Villa and Everton as he made an indelible mark on English football. He had a season to remember while at Spurs during 1998-99 when he claimed both the PFA Player of The Year and Football Writers' Footballer of The Year awards. In November 1993, France were level at 1-1 against Bulgaria in the final minutes of a World Cup qualifier and Les Bleus would have been on the plane to USA 94 had it stayed that way. But Ginola gave the ball away with a cross, Bulgaria scored and Emil Kostadinov's last-gasp winner in Paris sent France crashing out of the competition. Gerrard Houllier was the France manager at the time. It's safe to say he didn't take the heartbreak too well and the Musketeer spirit of 'one for all and all for one' was in short supply. "The adventure is over all too soon," said Houllier. "With only 30 seconds remaining we were there but we got stabbed in the back and at the worst possible time." In 2000, Ginola, who played 17 times for his country, complained in his autobiography: "Houllier blamed me for 'murdering' France's bid to qualify for the 1994 World Cup finals. "My 'crime' was to over-hit a cross aimed for Eric Cantona during our last qualifying match against Bulgaria in Paris." Ginola's long locks and model looks did not take long to get noticed by those marketing executives at a number of major firms. As well as treading the catwalk, one of his most famous adverts was for a men's shampoo. "I'm a footballer, not a movie star. I haven't got time to worry about my hair. I just want to feel good about the way I look," he mused in the advert. Yet Ginola did try his hand at acting after he retired from football. He starred in a film called Rosbeef as well as The Last Drop, which also included Michael Madsen - of Reservoir Dogs fame - and comedian Jack Dee. The Frenchman became the figurehead of the Red Cross anti-landmines campaign in 1998 after being chosen to take on the role previously carried out by Diana, Princess of Wales, prior to her death. "I am very honoured to be chosen to head this campaign - it is a cause that is worth fighting for," he said. "David spoke in very moving terms about why he wanted to do this work and we are very happy to have such a figure working for us," said Stephane Mantion, then campaigns director of the French Red Cross. Ginola was part of the BBC Sport team which provided coverage of the 1998 World Cup in his native France and has gone on to continue working as a pundit for various organisations. He was also one of the ambassadors for England's failed bid to host the 2018 World Cup before he decided to run for Fifa president. 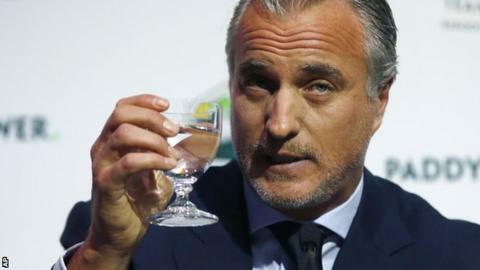 "We all know that the Fifa system isn't working," said Ginola. "By joining Team Ginola you are saying 'yes' to a Fifa built on democracy, transparency and equality. You are saying 'yes' to a Fifa which cares about one thing - football."